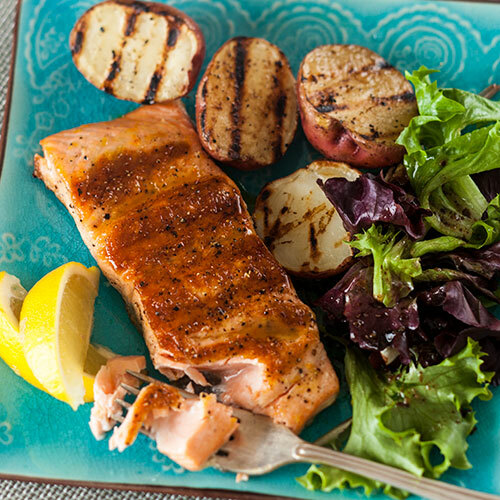 Take 2 fresh salmon filets and cut across in half. Place on a plate and pour half the sauce over it. Allow it to sit for 10 minutes. When the grill is hot, brush with oil to prevent sticking. Place the salmon (skin side down) on the grill and cook for 4-5 minutes. Turn carefully with a spatula and grill for 4-5 more minutes. When the salmon is almost done, flip on a plate. Spoon on fresh marinade and cover tightly with aluminum foil. Allow to rest for 10 minutes, cut the pieces in half and serve.